Everyone knows there are software to get the configuration using SNMP; but how can you copy the configuration if you don’t have any tool? Let me explain what is SNMP before show you how to implement it. Simple Network Management Protocol (SNMP) is an “Internet-standard protocol for managing devices on IP networks”. Devices that typically support SNMP include routers, switches, servers, workstations, printers, modem racks, and more. It is used mostly in network management systems to monitor network-attached devices for conditions that warrant administrative attention. SNMP uses an extensible design, where the available information is defined by management information bases (MIBs). MIBs describe the structure of the management data of a device subsystem; they use a hierarchical namespace containing object identifiers (OID). Each OID identifies a variable that can be read or set via SNMP. First of all, check if your PC has the SNMP suite; if not, install the net-snmp software (http://net-snmp.sourceforge.net/). snmp-community-string is the community key of your cisco router. ip-device is the ip address of your Cisco device. 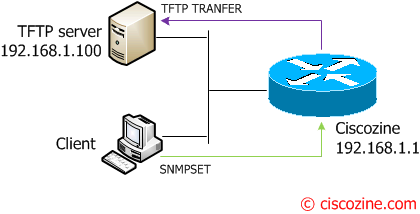 ip-tftp-server is the ip address of your tftp server. file-name is the name where the running configuration will be saved. Remember: The command syntax are the same on linux or windows devices. Suppose you have a Cisco Router (192.168.1.1) with the “c1sc0zine” community string, a tftp server with 192.168.1.100 ip address and you want to save the running configuration to the tftp-server (in the ciscozine.txt file). 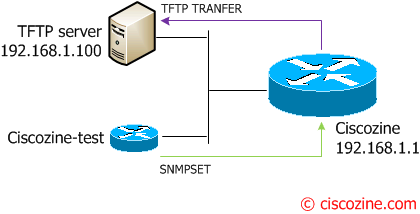 The client sends the “snmp set” commands to the router, then the router sends the running configuration to the tftp server using the tftp protocol. ccCopyServerAddress: The IP address of the TFTP server to copy the configuration file. In this case the tftp server is 192.168.1.100.
ccCopyFileName: The file name (including the path, if applicable) of the file. Note: When you run this command, the router will send the running configuration to the ftp-server! What can you do if you are not able to install/use the net-snmp suite on your pc? It’s simple! Use your router! as you notice, the last value of the second line is “3” and not “4”; this because I want save the startup configuration, not the running configuration! … and your tftp server will receive the startup configuration! Generally, the SNMP protocol is used to receive bandwith/error interface values, but not everyone know that it is possibile to save Cisco configuration using the ciscoConfigCopyMIB MIB.